An innovation at TEEbooks: a standing bookcase shelving unit! Designed as a real piece of furniture, it allows you to store and show off your books, CDs, vinyl, and more. This bookcase shelving unit, an object that is both stylish and functional, is place for you to keep your knowledge, music, stories and dreams. TEEbooks offers a solid and useful steel product that will last over time and protect your books, CDs and vinyl. Crafted in the best Italian workshops, the finish of our bookcases shows a rare finesse and guarantees a high-quality, durable and solid bookcase shelving unit. 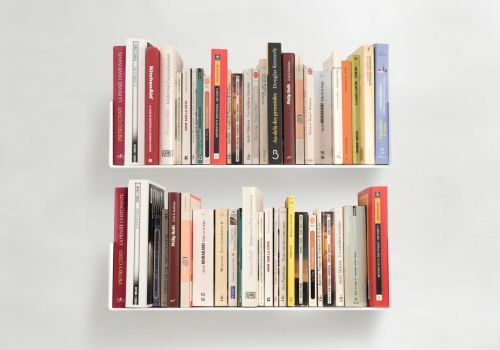 We love books, and that's why we decided to design the perfect bookcase shelving unit. At 15 cm deep, it's just right for a simple, aesthetic and durable storage solution. Today, a lot of bookcase shelving units are designed as decorative objects without thinking about what they are for in the first place: books. That’s why our bookcase shelving unit has been designed around books and for books. It is perfectly adapted in its dimensions, design and materials. On its shelves you can easily arrange your greatest novels, your most beautiful poems and your best plays! TEEbooks has always valued design. Our bookcase shelving unit is no exception. Above all, it has been designed to serve its purpose. Nothing superfluous, no unnecessary artifice, just your books, CDs and vinyl stored on our bookcase shelving unit with elegance and finesse. Created by designer Mauro Canfori, the BiblioTEE bookcase shelving unit is an object designed to adapt to any interior style. Its simple design allows it to blend in to any room whatever the décor, atmosphere or colours. Bookcase shelving unit There are no products in this category.